Posted on December 26, 2013 by Ronald Patrick Raab, C.S.C. In June of 2012, an astounding 360 people gathered at the University of Notre Dame for a major conference on Catholic preaching. 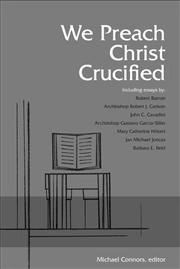 With contributions by a wide variety of theologians and practitioners, We Preach Christ Crucified gathers the fruits of those days spent reflecting on the importance of the preaching ministry. Its release is timely, given the US bishops’ promulgation of a new document on preaching, Preaching the Mystery of Faith: The Sunday Homily (January, 2013), and the renewed emphasis on preaching by both Pope Benedict XVI and Pope Francis. “Preaching among the Poor: A panel of Holy Cross Priests.” I gave a short presentation on my experiences preaching among people at Saint Andre Bessette Church in Portland, OR.